It is time for a new mattress. The old traditional mattress is sagging at the center of the mattress, which I believe is the source of bad sleep at night. I've shopped at many local mattress stores only to realize new spring mattresses cost an exorbitant amount of money. Easily over $1000 for a queen sized mattress. Additionally, the haggling aspect of buying a mattress is not something I prefer and would rather purchase a mattress at a set price. Great price, including shipping and tax (ordered to California), the total cost of the Queen size 10 inch mattress was $500. That's nearly half the price of the cheapest traditional spring mattress. And I didn't have to haggle for the price! I ended up purchasing the 10 inch Tuft and Needle mattress, but the 5 inch Tuft and Needle Mattress got great reviews on Amazon. At the time of the review, it got 5 stars with 505 reviews. 428 of the 505 were 5 star reviews, 57 of the 505 were 4 stars reviews, and 12 of the 505 were 3 star reviews, 5 of the 505 were 2 star reviews, and only 3 of the 505 were 1 star reviews. There is a 30 day trial of the Tuft and Needle mattress. They send you a new mattress for you to try. If you don't like it after 30 days, returning the mattress (based on other reviews) is pain-free and you get your money back. They don't charge return shipping if you choose to return the mattress after 30 days. My question to myself was, "What does Tuft and Needle do with returned mattresses?" and "Do they refurbish the Tuft and Needle mattress for new customers?" The answer to both questions is answered right on Tuft and Needle's website. Returned Tuft and Needle mattresses are donated to charity. Only new mattresses are delivered to new customers. 10 years warranty on the mattress. I did not look into the details on the warranty, but based on their easy trouble free return policy, I find no reason to believe they would hassle a return of a defective warranty. Comparing Tuft and Needle to Casper, I read that the biggest difference between to two brands is that Tuft and Needle is more firm while Casper is softer. There are many complaints of memory foam mattresses being too hot (not enough air circulation), which I was afraid would be the case with the Tuft and Needle mattress. Many reviewers also suggested similar concerns, all of whom said this was not a problem. The issue is resolved with the layer latex. Most other traditional mattress makers order their mattresses from abroad where they sit in the warehouse until they are sold. Lots of middlemen along the way that drive up the costs. Tuft and Needle are different because their mattresses are made in the US when you order it. All the middlemen are cut out which result in lower prices. Concerns about toxic chemicals during the manufacturing process of the foam mattress. However, their website claims to be made of polyurethane foam that has been tested by CertiPur-US to meet high standards in performance, content, indoor emissions, and environmental stewardship. Additionally, there are no chemicals used as flame retardant, but the rayon surface is fire resistant that comply with flammability standards. Delivery was arrived on the day it was scheduled. Given it's such a large package (14" x 14" x 53") and 78 lbs, I was convinced there would be some delay. Other than dragging the package up the stairs, unboxing and cutting open the plastic wrapping was more or less simple. The moment I started cutting the plastic wrapper off, the Tuft and Needle mattress began to expand. I cut very slow to make sure I didn't cut the mattress itself. I disliked the strong chemical-like smell from my new Tuft and Needle Mattress. It took at least 3 days before the smell went away, and was strong enough to cover the entire room with the smell. I contemplated returning it and wondered why Tuft and Needle chose not to air out the mattress before shipping the mattress to customers. However, by one week, the smell was completely gone. It's been about 3 weeks now and I'm almost 100% certain to keep the mattress. I've been getting very good sleep. My arms are never asleep (tingly feeling) when I wake up. My lower back has also been less sore in the mornings. One aspect I did not expect, but also is not a deal breaker for me is that sitting on the edge of the bed (say when putting on my socks in the morning) is more difficult, since the edge of the bed does not have the same support as a traditional spring mattress does. Now, I just put on my socks standing up. I had a chance to contact their customer service regarding the look of my mattress, which looked different than their website pictures. The response was fast and they told me their mattress are always undergoing improvements! A combination of good customer service and always improving their product equals a great company. All in all, I love my Tuft and Needle mattress. The old spring mattress is going to the guest room. 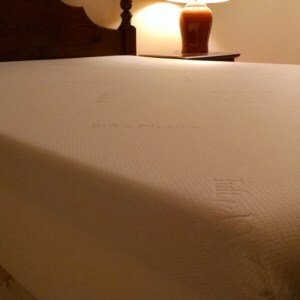 Tuft and Needle has ended their $50 referral link program, but the mattress is so good that I am still writing up my thoughts on the 10 inch queen size Tuft and Needle mattress and I recommend it to friends.